This post is part of a virtual book tour organized by Goddess Fish Promotions. Vikki Walton will award a randomly drawn winner via Rafflecopter a $25 Amazon/BN GC. Click on the tour banner to see the other stops on the tour. “That’s right. In fact, I have my own suspect list.” Shoot. Why did I say that out loud? “You do, do you? Are you a private detective, Ms. Freemont?” He stepped closer. “No. But…” She inched back, stopping when her heel twisted. Was he judging her by the heels she wore? She should never have let Kandi convince her the dress needed heels instead of ballet flats. She bristled at his appraisal. Well, she’d show him what she could do. “Good. Let’s keep it that way.” He tipped his hat, “Ms. Freemont, Sam.” He strode toward the pub. Anne sighed in frustration. That man is incorrigible. About the Author: Vikki is a well-liked speaker and knowledgeable instructor on myriad topics such as fundraising, work quilting, creative writing, design, homesteading, travel, and getting what you really want out of life. Her diverse background and passions enables Vikki to speak and write about many subjects. She’s the author of Work Quilting, a top ten book on vocational guidance. She’s also a global house and petsitter, founder and travel blogger at girlswanta.com and upcoming book on women’s travel. 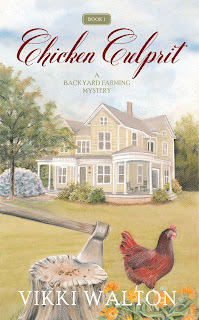 If Vikki isn’t off exploring the globe, you’ll find her at her home in Colorado digging in the garden, watching her chicken’s antics, reading a mystery or working on her newest project.